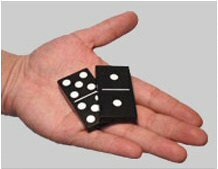 Out of the big variety of elements that can be used in close up magic domino chips are perhaps the least explored. This is something certainly curious considering that everybody knows about the game and consequently it is perfectly normal to everybody’s view. They also have a very suitable size for their handling and their appearance is so simple that it avoids any tricky suspicion and it grants the clearness of some effects. VERNET MAGIC is very proud to present “Hopping Dominoes” by Ren –Nee. A new version of the famous coin trick called “Hopping Half”.This is a shocking version ideal for parlor close up and restaurant magic with the well known Vernet quality.